Jane Marie Lynch (born July 14, 1960) is an American comedian, actress and singer. 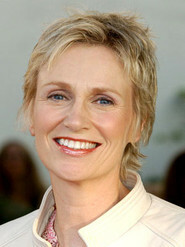 Since 2009, she has played the role of Sue Sylvester in the Fox musical-comedy series Glee for which she has won an Emmy Award and a Golden Globe Award. She has also played roles in comedies such as Best in Show, The 40-Year-Old Virgin and Role Models, as well as for her recurring roles as lawyer Joyce Wischina in The L Word, Dr. Linda Freeman, Charlie's sarcastic therapist on Two and a Half Men and as Spencer Reid's mother, Dr. Diana Reid on Criminal Minds. She has appeared on iCarly as Sam's mother. She was also a regular on the comedy-drama series Party Down as Constance Carmell; the role garnered her positive critical response. Description above from the Wikipedia article Jane Lynch, licensed under CC-BY-SA, full list of contributors on Wikipedia.